Do criminal penalties have any deterrent effect on drug addicts – people who already are willing to throw away their jobs, relationships, or even lives for their “fix”? What does brain science tell us about addicts’ capacities to exert self control and to be held criminally responsible? 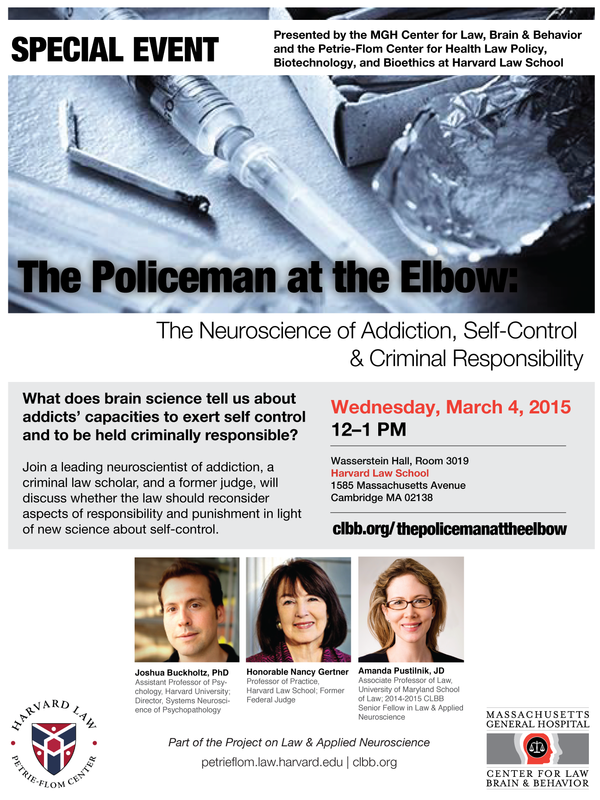 On Wednesday, March 4, 2015, a leading neuroscientist of addiction, Joshua Buckholtz, a criminal law scholar, Amanda Pustilnik, and a former judge, Hon. Nancy Gertner, discussed whether the law should reconsider aspects of responsibility and punishment in light of new science about self-control. The event was held from 12-1pm at Wasserstein Hall at Harvard Law School. Joshua W. Buckholtz, PhD received his B.S. degree (2003) in Psychology from the University of Wisconsin-Madison, where he worked with Joseph Newman. 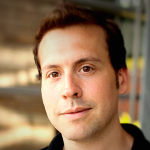 From 2003-2006, he received training in functional imaging and genetics while working as an NIMH post-baccalaureate research fellow in the Genes, Cognition and Psychosis Program under the supervision of Daniel Weinberger, Andreas Meyer-Lindenberg and Joseph Callicott. In 2011, he was awarded a PhD in Neuroscience (with First Honors) from Vanderbilt University under the mentorship of David Zald. He is currently an Assistant Professor of Psychology at Harvard University, where he directs the Systems Neuroscience of Psychopathology laboratory (SNPlab). He is also Assistant in Research in Psychiatry at Massachusetts General Hospital. Judge Nancy A. Gertner is Professor of Practice at Harvard Law School and a former federal judge. She was appointed to the bench in 1994 by President Clinton. She has been an instructor at Yale Law School, teaching sentencing and comparative sentencing institutions, since 1998. In 2014, she was selected as one of five recipients of the 2014 Margaret Brent Women Lawyers of Achievement Award, established by the ABA Commission on the Status of Women in the Profession, for accomplishments in the field and inspiration to other women. She has published In Defense of Women: Memoirs of an Unrepentant Advocate (2011), The Law of Juries (1997), and many articles, and chapters on sentencing, discrimination, and forensic evidence, women’s rights, and the jury system. 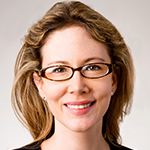 Amanda C. Pustilnik, JD is Associate Professor of Law at the University of Maryland School of Law and a faculty member of the MGH Center for Law, Brain & Behavior. She is also the 2014-2015 Senior Fellow in Law & Applied Neuroscience at CLBB and The Petrie-Flom Center for Health Law Policy, Biotechnology, and Bioethics at Harvard Law School. Her work explores the interrelationship between normative and scientific concepts of mind and brain in areas including evidence law, criminal law, and disability. This conversation is part of the Joint Venture in Law & Applied Neuroscience between CLBB and the Petrie-Flom Center for Bioethics of Harvard Law School. Amanda Pustilnik is the Joint Venture’s 2014-2015 Senior Fellow in Law & Applied Neuroscience. 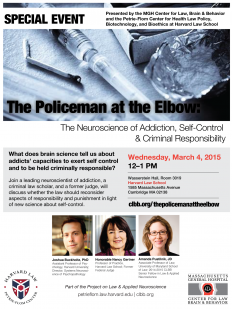 Watch the “Addiction” event below, or explore past events on memory, free will, and empathy on CLBB’s Vimeo channel.